Last month, Rammstein shared four stills from the set of their new video shoot. The Instagram post showed that they were working with director Jonas Åkerlund, with the clapperboard suggesting the title was Black Dog, Big Fish – and it had a distinctly religious feel. 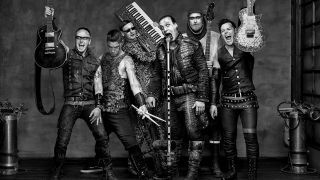 Now Rammstein have uploaded another five pictures, showing a variety of other stills from the video, including the band travelling in a classic car and what appears to be a brawl. The follow-up to 2009’s Liebe ist für alle da is expected to be released in the coming months, with guitarist Richard Kruspe also previously telling Kerrang that they were planning on releasing five videos from the record. Speaking about the as-yet-untitled album recently to Metal Hammer, Kruspe said: “We started on five or six years of ideas and took it from there. We were talking about harmonies, how certain kinds of melodies can change things. Things we never really cared about in the beginning, but things that matter more now.